The "Hickory Air-Tight" is a plain Heater, oval in shape, that will, as the heading says, throw out a tremendous heat, and you can use any kind of fuel in it except coal or coke. It has a hot blast downdraft device that makes it very economical on fuel, makes the fire easily controlled, and gives a more even distribution of heat. By means of the hot blast downdraft, the cold air in the room is brought to the bottom of the stove; coming in contact with the hot outer jacket, it is heated as it rises and is discharged from the top into the room. In fact, we guarantee that the "Hickory" will be found the equal, as a distributor of heat, of any direct draft, sheet-steel, air-tight stove using wood as fuel. 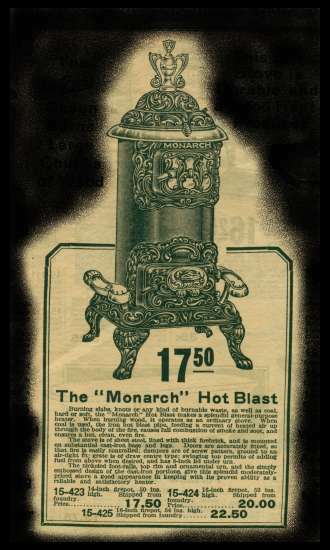 Burning slabs, knots or any kind of burnable waste, as well as coal, hard or soft, the "Monarch" Hot Blast makes a splendid general-purpose heater. Doors are accurately fitted, so the fire is easily controlled; dampers are of screw pattern, ground to an air-tight fit. 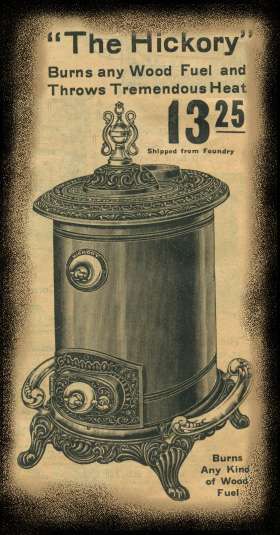 The nickeled foot-rails, top trim and ornamental urn, and the simply embossed design of the cast iron portions, give this splendid, moderately-priced stove a good appearance in keeping with its proven ability as a reliable and satisfactory heater.